Trans* Jersey met with Helen O’Shea, Managing Director of the General Hospital, and Richard Jouault, Managing Director of Community and Social Services, today. As a result, we have now had the pathway to care for trans* islanders confirmed, and it is as shown. Trans* Jersey will be working on getting this into a form that can be distributed to all GPs’ surgeries so that, as the first point of contact for trans* people, doctors know who to refer to and can advise their patients on the pathway to care. This is the first of our 2014 manifesto goals to be realised. We are, therefore, grateful to the States of Jersey’s health service professionals for their openness and time to assist us, and to those trans islanders who shared their experiences of the health service in Jersey and the UK. I can see the ‘care pathway’ quite clearly but the issue over funding is not so clear. 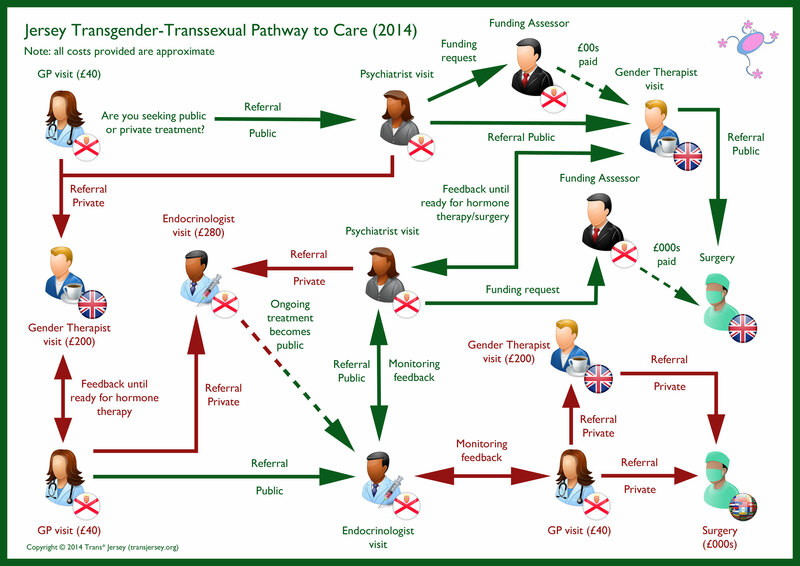 There are two points where funding may be requested on this flow diagram: the first is if the psychiatrist here requests funding by referring the person to a gender specialist in the UK and secondly, what these UK specialists recommend will also need a further funding request. Is this how it works – a two stage application for funding? I argue that there should be only one request for funding and that at the very start. The new guidelines from the Royal College of Psychiatrists (CR 181) states that ‘treatment should not be prescriptive’ which raises an interesting point. The first application for funding should be the only point of request therefore, because Jersey is then medically bound to follow whatever the recommended care plan is by the specialist clinicians in the UK. The specialists in the UK are the ones who make the clinical judgements and Jersey has no option but to follow their clinical recommendations. This flow diagram has an unnecessary second point of funding therefore; unless surgery is discretionary? It is far simpler to have one application for funding from the psychiatrist here and then factor into this first funding request that cross-hormones and surgery are likely at some point. This does away with the costly administration of a second funding request. All it needs is an accountant to cost the triadic regimen that all gender identity clinics follow and budget for it in the first request. The tariff in Charing Cross is: Assessment £562, follow-up/Workshop/1:1 counselling £296, Group therapy £102, prescriptions are free and GRS currently is £11,500. It’s not rocket science! There are other treatments such as hair removal, speech therapy, or cosmetic surgery which may be discretionary and have to be funded by the patient. The care pathway policy will need to state what Jersey is prepared to fund. Although for a great many transmen and transwomen the same pathway applies (i.e. hormone therapy and then lower surgery for transwomen and top surgery for transmen). This is not always the case. The NHS are very clear that treatment of trans* patients should not be prescriptive. It is, therefore, not possible to set a tariff for everyone who undergoes a transition. There are so many variables that a two stage funding process is going to be necessary. Take the example of someone who is questioning their gender. The right course of action is for their Jersey psychiatrist to refer them to the UK for gender therapy. During the course of which, they decide that they do not want to transition. At which point, no further funding is required. Or, take the example of a transwoman for whom facial feminising surgery is more important than lower surgery. Her surgery could cost considerably less than a transwoman having GRS. Or, take the example of a transman who does not want chest surgery because he is naturally flat-chested. The permutations of individual cases are quite varied. I have raised the issue with the relevant clinicians in the States and, in addition to the above arguments that make a single request for funding difficult, there is also the fact that the funding for gender therapy comes from the budget used by the mental health services and the funding for surgery comes from the budget used by the general hospital, which makes sense as if Jersey had the skills “inhouse” to provide these services they would be separate funding streams. However, the good news is that I have had it confirmed that the applications for funding gender therapy and/or surgery are not something that the client has to undertake. The applications are made by their Jersey psychiatrist to the relevant departments.